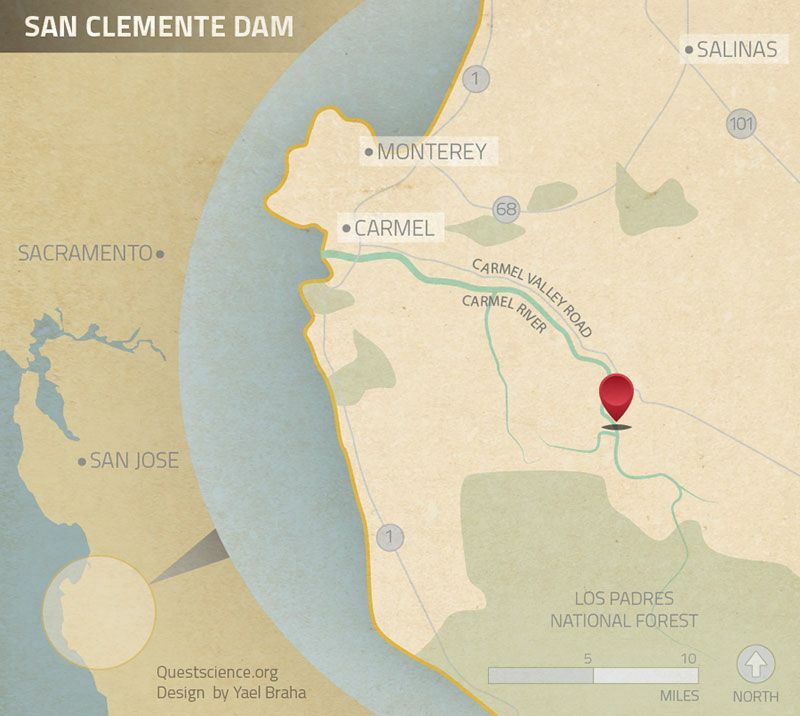 CARMEL VALLEY — A ceremonial groundbreaking in Carmel Valley on Friday marks the beginning of the end for the 92-year-old San Clemente Dam. The largest dam removal project in California history comes nearly 20 years after state inspectors declared the 106-foot-tall concrete structure unsafe and at risk of collapse in an earthquake. “If an earthquake were to cause it to have any breaks it would collapse quickly,” said Trish Chapman, regional manager for the state Coastal Conservancy, which is helping fund the $84 million project. Like most dams, the reservoir has accumulated sediment over the years, so much that it’s now 95 percent silted up and no longer provides water to the Monterey Peninsula. Altogether, 2.5 million cubic yards of sand, gravel and other sediment – enough to fill 767 Olympic swimming pools – has piled up behind the dam. The dam’s owner, California American Water Company, based in Coronado, will pay $49 million toward the project, funded through rate increases on Monterey water customers that amount to about $2.55 a month for average residential users over the next 20 years. Not only will 1,500 homes and structures downstream be safer after the three-year project is completed, but removing the dam also will help restore habitat for red-legged frogs and steelhead trout whose numbers have plummeted in recent years. 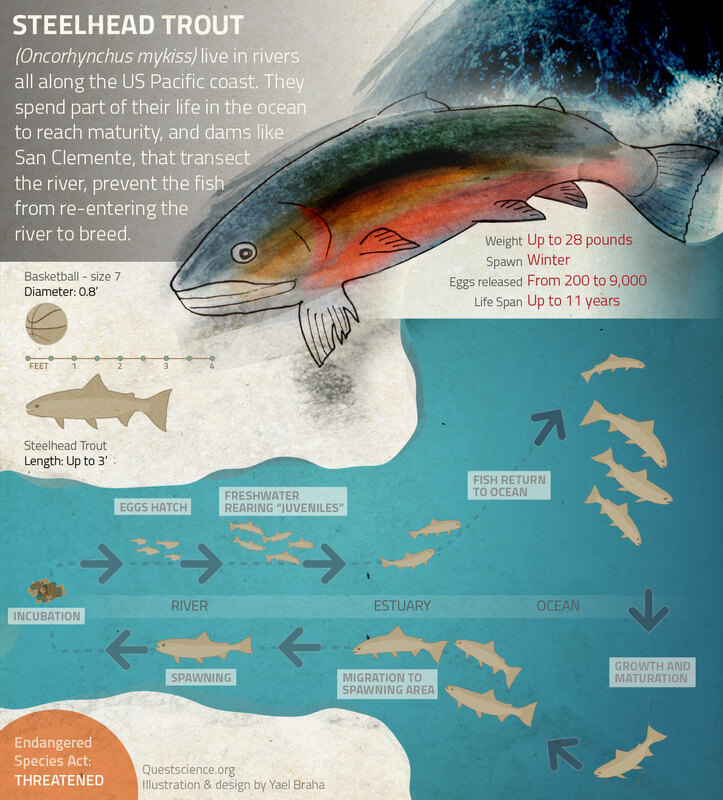 A trout population that numbered 1,350 in 1965 has dwindled to 249 this year, in part because the dam blocks the fish’s migration to and from the ocean. “I’m excited because we’ve been relocating these frogs and fish—now we’re going to let nature take over and let her do what she does best,” said Brian Stranko, regional director for the Nature Conservancy, which contributed $1 million to the removal. 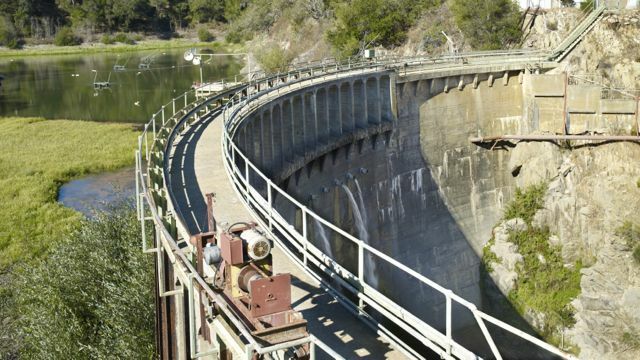 Under the project, construction crews will permanently reroute the Carmel River for about half a mile around the sediment, then tear the dam down over two years. This project, which also received some funding from federal grants, is being watched as a possible model for other dam removals across the country. “It’s a good example of where the community came together and recognized there is a reason why people and river would benefit from taking [the dam] down,” said William Irvin, president of American Rivers, an environmental group based in Washington, D.C. The largest dam removal project in the country was the demolition of the 108-foot Elwha Dam and the 210-foot Glines Canyon Dam near Port Angeles, Washington, a project that began in 2011. That demolition released more than 24 million cubic yards of silt and other debris downstream. Ecologists are still waiting to find out how it will affect fish and other wildlife. Irvin said that projects like the San Clemente are part of a broader movement, one that favors dam removals. There are approximately 79,000 dams in the U.S., according to the Army Corps of Engineers. Thousands of them are obsolete, silted up or otherwise suited for removal, although finding the funding to remove them and figuring out what to do with the millions of tons of sediment behind them often pose major challenges. congratulations American Rivers and all of the supporting environmental organizations. JUNK SCIENCE! Check the data. None of the samples from condors can be directly related to bullet fragments. No analysis have been done to determine where the lead came from. Good forensics could not only tell whether the lead came from bullets but from what manufacturer and what mine it came from. Based on the amount of Antimony in the fragments. THIS IS AGENDA BASED SCIENCE, POLITICAL SCIENCE, not fact based application of the scientific method.